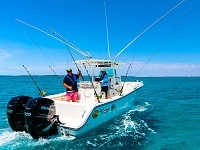 We rate and review twin Mercury Verado 300hp outboard motor on a Mako 284 CC fibreglass fishing boat. 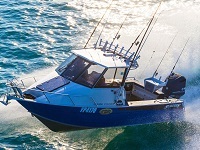 We tested a pair of 300hp Mercury Verado outboard motors on the back of a Mako 284 Centre Console at our most recent annual Australia’s Greatest Boats comparison. 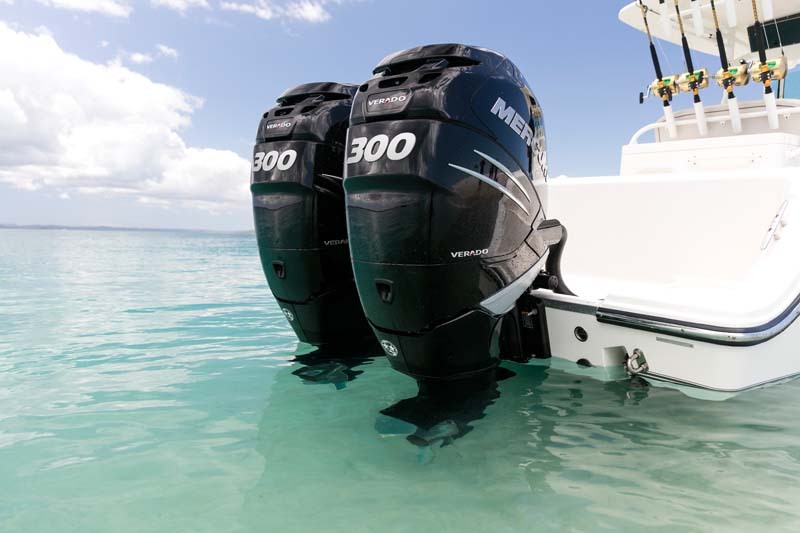 Something interesting happened when we reviewed these twin Mercury Verado 300hp outboard motors – they didn’t perform as expected. 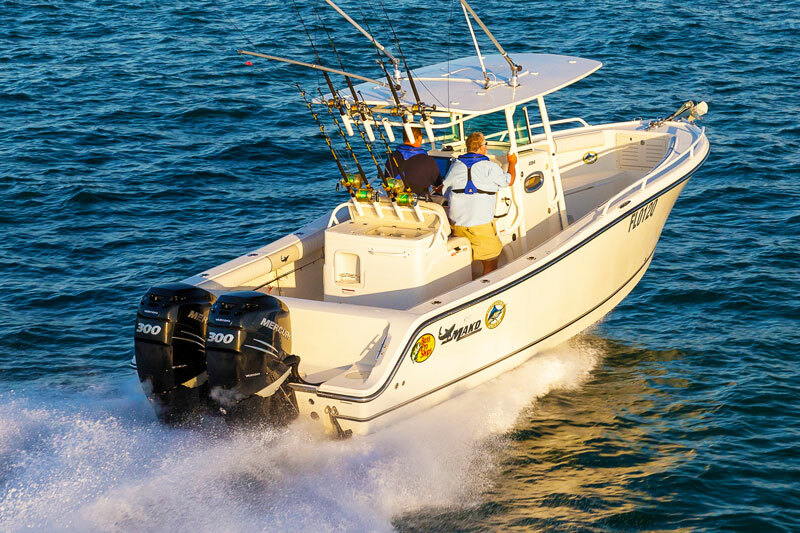 Having previously tested a pair of 350hp Mercury Verado outboards on a longer, wider and heavier Axopar 37, we expected more from these two marine engines. Maybe they weren’t propped right but we saw 6120rpm – right in the sweet spot for max rpm – and recorded 224 litres per hour fuel consumption pumping through both outboard engines, exactly what we expected for fuel burn. They were also well broken-in with more than 100 hours on the clock when we climbed on. The hull wasn’t dirty as the Mako 284 CC review boat lives on a trailer. 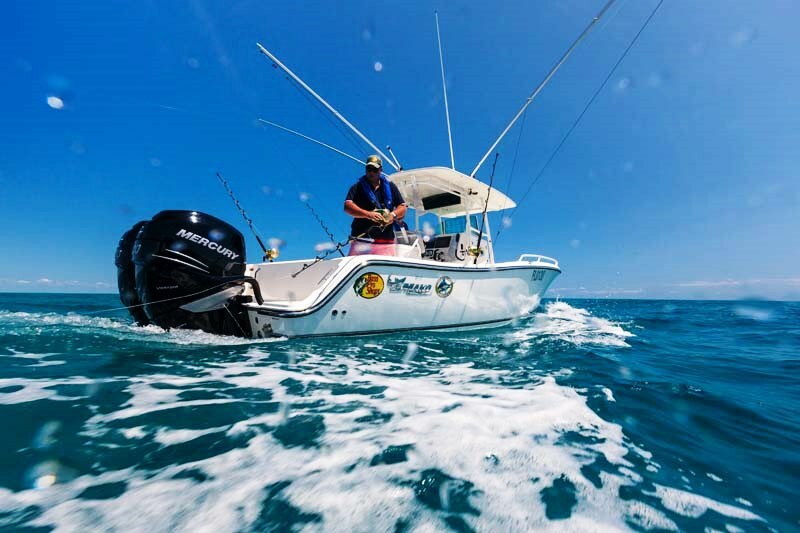 Too low an engine height for the twin Mercury Verado 300hp outboards is one theory but in turns, even with four-blade stainless propellers and trimmed in, we still got some ventilation so they can’t have been significantly too deep. 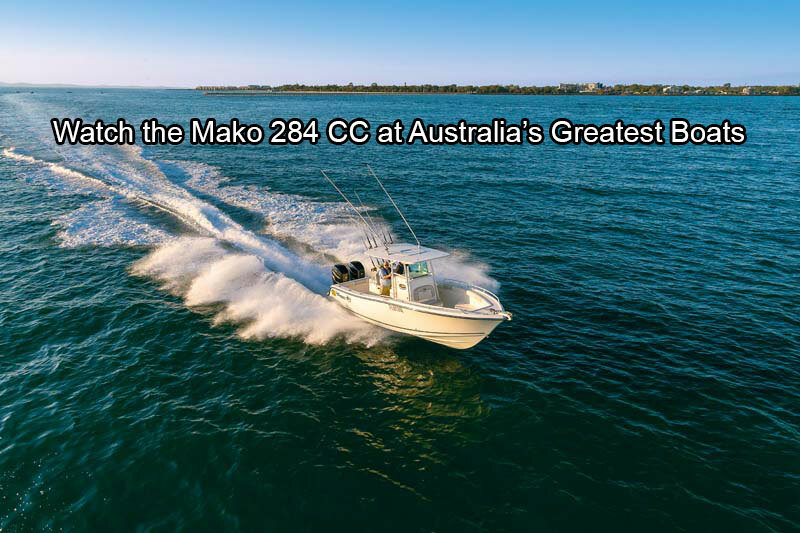 The Mako 284CC is 8.6m LOA with a 3m beam and on-water weight of about 3500kg while the Mercury Verado engines were 25in leg lengths. We found that the twin 300hp Mercury Verado engines were most efficient at 3500rpm where they burnt a combined 66 litres per hour, pushing the hull to 23 knots (42km/h) and delivering 0.35 nautical miles (0.65km) per litre. That’s not bad but to give it some context, the previously mentioned Axopar 37 (above) returned the same economy at the same rpm, yet the twin Verado 350 outboards had to move an extra 500kg with 300mm more beam and 2.5m more hull length. Perhaps waterline length and hull design are showing their hand? Redeeming themselves, with these Mercury marine engines singing at 6120rpm we managed 46 knots (85km/h) while consuming 224 litres an hour combined. This gave a respectable 0.25nm (0.46km) per litre, which bettered the Axopar’s twin Verado 350s at the same speed, leading us to speculate trimming was a major influence. Looking deeper into the figures, the idea that we were trimmed in too tight gains traction. At 5500rpm, fuel burn was the same 224L/h combined, telling us the injectors were at full duty cycle (maximum flow) which is only possible at wide open throttle, yet speed was only 42 knots. With further outward trim, the engines lifted more of the hull from the water, gaining the last 620rpm and four knots. 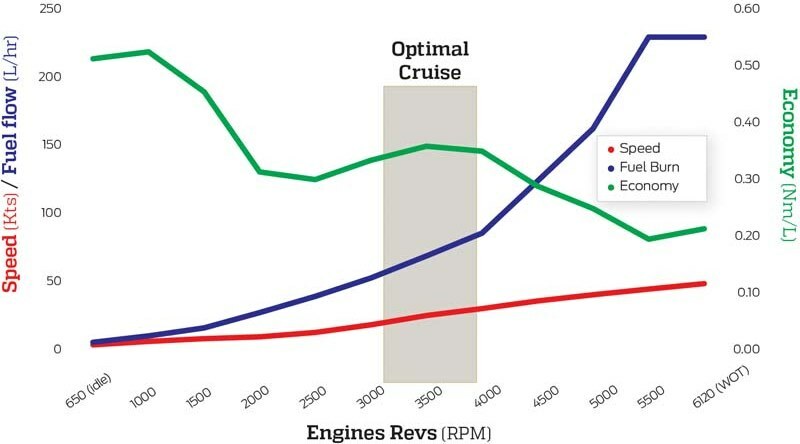 What this means for the optimal cruise is a tough call but we would expect improvement.